Carried my quite freshly required Kapara almost exlusevly over the last couple of days and did quite a bit of work with it - everything from food prep to outdoor stuff (wood, fire prep and so on) - it is a really great knife. What I´d really like to see some day: Aftermarket scales in rough Micarta. Don´t get me wrong, I DO love the Carbon scales and their feel and style - but I could easyly imagine owning a second, more "outdoorsy" Kapara - rough Micarta scales would beautifully contrast the overall "gentleman" - style of the knife. And, let me say this: It performs very good in outdoor / woodscraft tasks. Here you can see the length of the Manix LW clip is greater than that of he Kapara and Urban. I wanted a shallow carry Urban, so I bent some 316 stainless steel TIG welding filler metal into the form mimicking the Manix clip's shape and the original Urban clip's length. The same can be done for the Kapara. I used 1/16" wire, which is approximately 1.5-1.6mm. It took multiple attempts to get it right, so don't lose hope if the first few are no good. Thank you very much for your reply and the time you took to send (and make?) the pics!! I apreciate that a lot. Judging just by your depictions I would figure, that it would be possible and no problem to install the longer Manix LW clip on the Kapara, it would at most hurt optics, not function (maybe holding the knife in hand would be less ergonomic with a longer clip) - what do you think having the knifes in front of you? 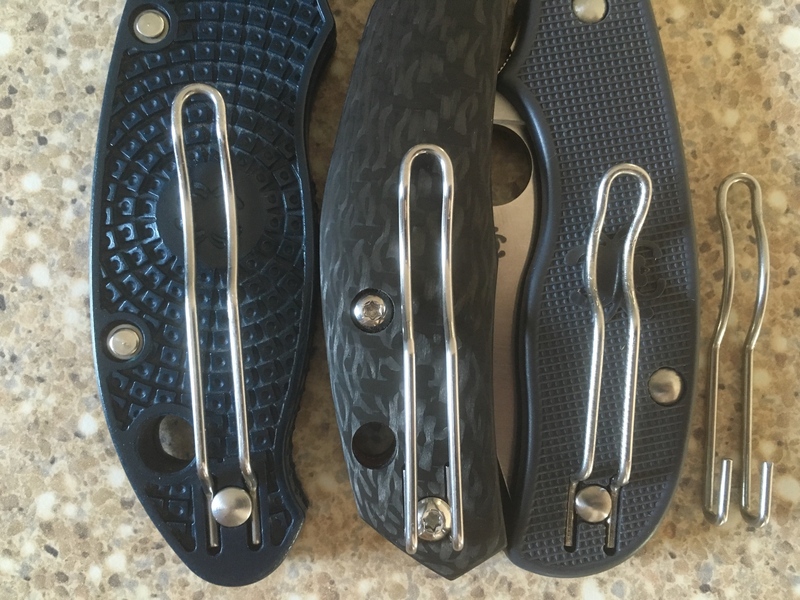 The slots designed to accomodate the clip seem to be of the exact same dimensions on every Spydie-wire-clip knife, am I right? The Manix clip would certainly work on the Kapara, but I wouldn't want such a long clip on it. You're right to consider the stiffness of clips, but I find that a shallow carry clip is stiffer, not more wobbly, than a deep carry clip of the same length. The length of wire used is the major factor affecting stiffness. Deep carry clips require more wire, making them inherently less stiff. 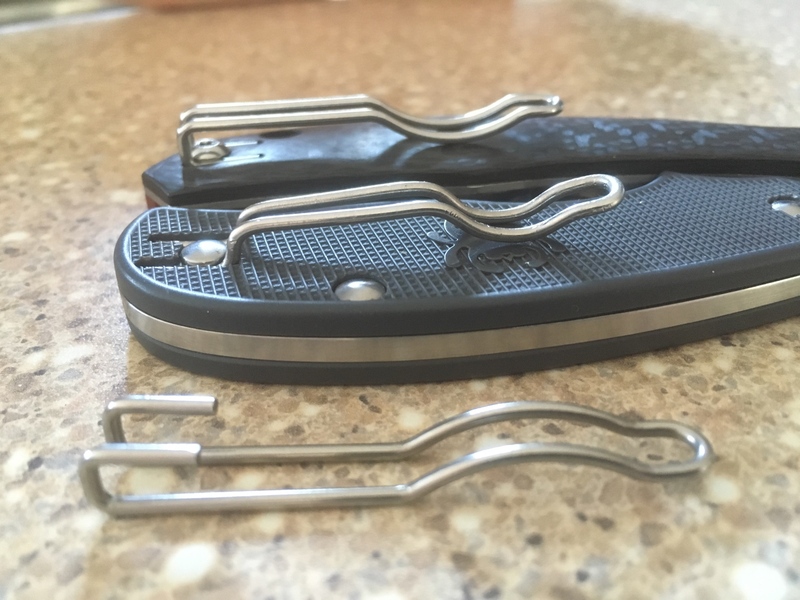 When I find the time I´ll scroll the Spyderco-Catalouge (again... to find out if there is a shorter SHALLOW-carry wire clip..
- BUT: The mounting screw for the clip on the Kapara is located at the REAR end of the slots holding the clip (on the Manix the screw is on the FRONT end of the slots): So: If you imagine the Manix wire clip beeing held by a screw at the very end of the portion that is located in the slots, thats a much worse leverage than if the screw is holding it at the front end of the wire that is located in the slots. The latter is the case on the Manix, and for a reason I guess - ? Again, hard to express in english for me, but just look at the Kapara and the position of the mounting screw, imagine a Manix clip would be installed and what kind of leverage would be transfered on the screw, maybe than you get what I mean... ? I understand your meaning now. I never noted that tiny detail of where the screw holes are relative to the slots. It's an intriguing question, so I just swapped clips between my Kapara and Urban for a few minutes to check stiffness. Neither seemed too wobbly, so I would be comfortable with a shallow carry clip on the Kapara. 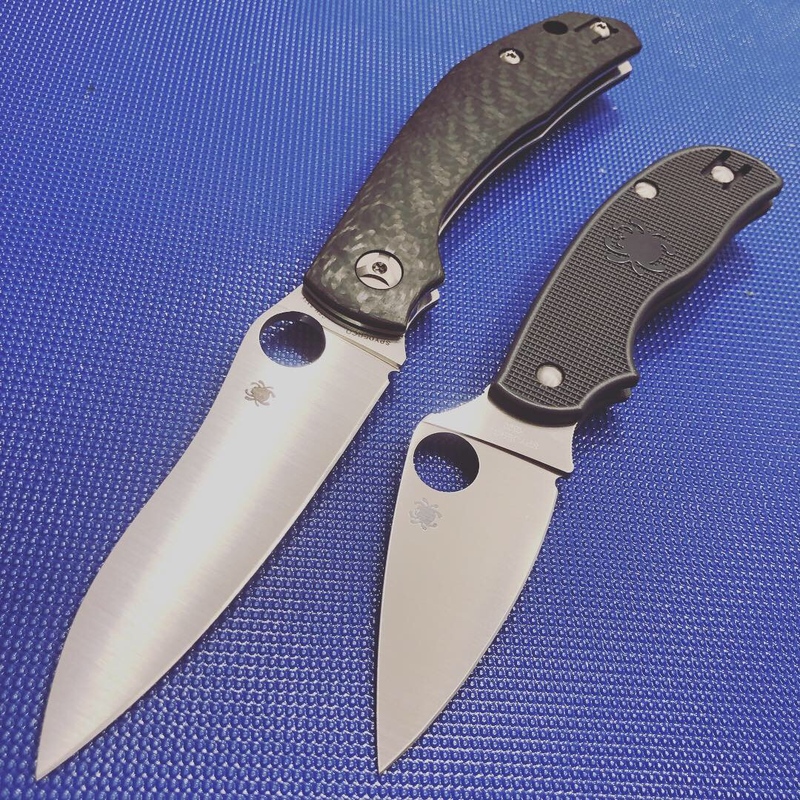 I recommend asking Spyderco directly, but the clip that I think might work is that of the P'kal. Also take note of the placement of the screw. By the way, your English is excellent. Thanks again for your reply, thats great! I do not have the right knives at hand to try out what you did, so thats a real help for me. You for yourself do like how the Kapara carries with the deep carry clip? I do not like that in that Configuration it extends even further down in the pocket as an Endura, that´s to deep for a comfortable carry imho . Especially in tighter pants and when moving a lot (I do a lot of mountaineering and climbing, so this is an issue for me). After having the Kapara a couple weeks, I still love it's aesthetic, but the non buttery PM2-3 opening/closing still bugs me, which is also true for my Caribbean, PM2's and 3's remain King. It's a knife, not a toy bud. Enjoy it for what it does! Can't wait to get me one of these masterpieces. Using a knife that is easily opened and closed with one hand, without fumbling around, does not make it a toy. Back in the day, I had an Endura as my only Spydie. While the length is similar, the Kapara carries more like a Delica than Endura, IMO. It's narrower and slicker, and still doesn't reach the bottom of the pocket. It just stays out of the way toward the back of the pocket. I have to say though, it's not quite as smooth as a nice liner lock, like a Pattada. I don't find the Kapara to sit too deeply in my pockets usually. I like pants with deep pockets, though, so I usually don't have a problem with that. Dress slacks, one of my shorts, and a couple jeans have shallow pockets, but I don't wear them frequently enough to be a concern. If I were carrying a large folding knife while wearing restrictive climbing clothing, I'd wear it inside the waistband, in a cargo or jacket pocket, or in a bag. I've had both big and small knives come unclipped and fall out of my pockets during outdoor activities. I am more cautious with folders and prefer fixed blades in certain situations. Most of my unclippings happened due to outer garment layers (coats, etc.) being grabbed by the clip and pulling the knife up when I moved around. to your body/belt with a lanyard and clip, especially when climbing ? If it were a climbing implement, I would certainly think to clip it. Since, to date, I don't tether/lanyard my folders, and not having done proper climbing in years, I wouldn't have thought to tether a folder. It makes perfect sense, though, so I appreciate the food for thought. It's more mundane outdoor activities in which I've run into unclipping by accident. Nowadays, I sometimes change where I stow my knives to minimize the possibility of snags. Perhaps a quick-detaching tether solution would be beneficial to look into for outdoor activities. It was hammered into us to tether everything, climbing, boats. A few weapons and fuel tanks were saved because of it. just glad things were tethered. Agree re " minimize the possibility of snags". BTW, I was a crap climber, too heavy and low strength to weight ratio but had to do the qualification. Para cord is excellent tethering cord, doesn't tangle / knot easily. What I do to my outdoorfolders after loosing a very much loved Endura out of the pocket: I remove the clip, bend it down, attach it again so it is very tight. Not too comfortable, since the knife is harder to pull and especially hard to clip it to the pocket again. But worth it if you wanna keep your knife in the outdoors. Thanx for your reply! What I found: The more horizontal the rim of your pocket is, the less likely you'll loose the knife. Many outdoorpants however do feature pockets with rather more "angled towards vertical" rims, which makes the pocket acces more comfortable but the knife more likely to get lost. Most traditional jeans in the other hand do have rather horizontal pocket rims. My girl asked me to help her prepare dinner tonight. So out came the Kapara! We diced a some potatoes, chopped up a couple jalapenos, and cut up a roast chicken. The Kapara performed very nicely. Ali designed the knife for BBQ's which re very popular in Oz. I can definitely attest to its ability as a great steak knife for a BBQ. At one of the Australian Blade Symposiums we all got around for a BBQ meal at the end of the day. The caterers had provided plastic cutlery which was woeful for the food they had prepared. Luckily most of us had knives we could use instead . I was carrying the Redback prototype that day. Alistair was kind enough to post a “how to” video on adding a sharpening choil his YouTube channel. I took his advice and did it on my Kapara. I’m really pleased with the results. I did a test run on my Urban before trying it on my more costly Kapara. My next mod will be to try and increase the detent strength which is pretty weak.